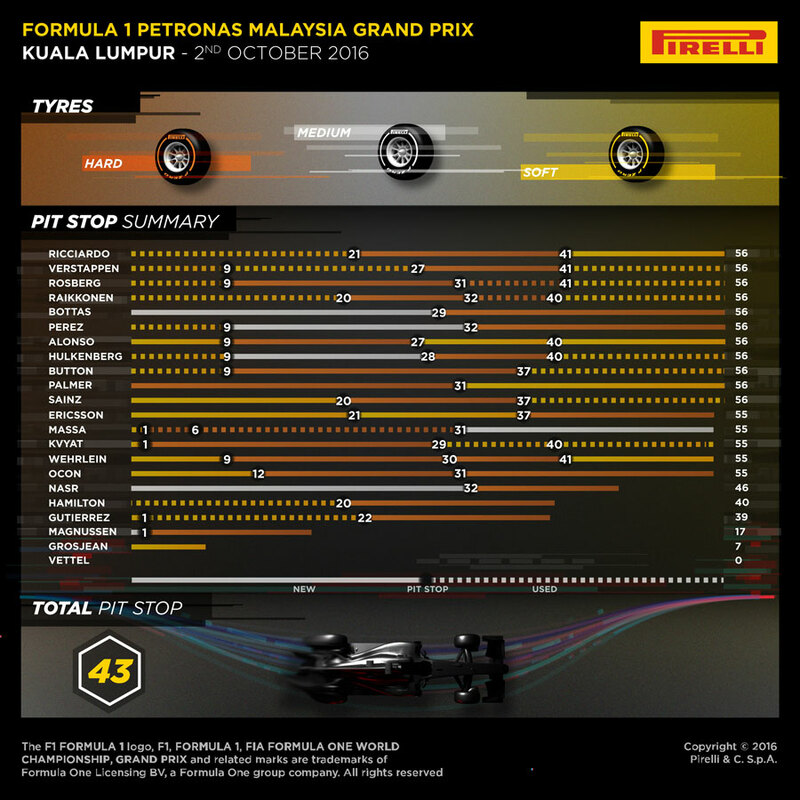 Malaysian GP F1 Strategy Report Podcast – our host Michael Lamonato is joined by Rod Gordon from Superlicense F1 Podcast. 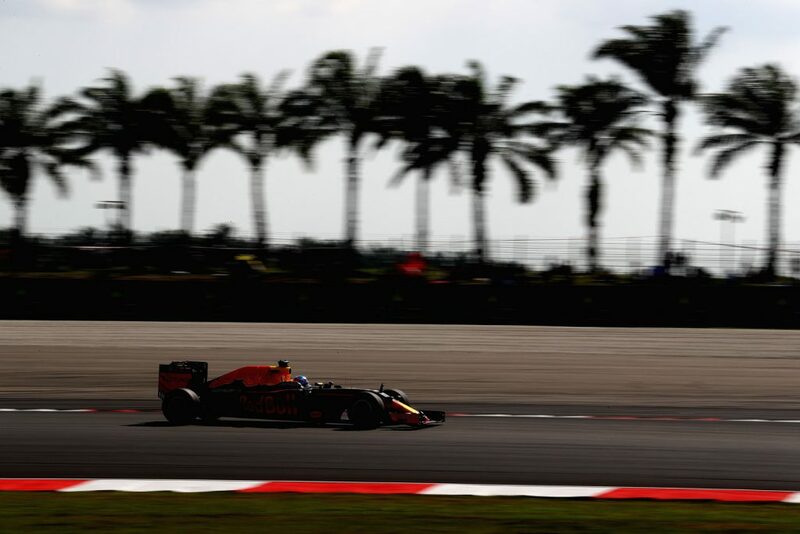 The 2016 Malaysian Grand Prix kicked off with high drama at the first corner, before calming down until the excitement returned for the final 20 laps. Daniel Ricciardo held off his team-mate Max Verstappen to take his first win of the year, after Lewis Hamilton retired from the lead with 15 laps to go after a spectacular and fiery engine failure. Nico Rosberg was rudely tapped into a spin at the first corner by Sebastian Vettel, ruining the Ferrari driver’s race and severely hampering Rosberg’s challenge. He dropped right to the back of the field but his fight back was impressive and showed the dominance of the Mercedes W07. Mercedes opted for quite an aggressive strategy to get him up the field. Having started on the soft tyre, he then switched to the hard compound for a long middle stint, where he could make progress up the field due to the advantage he had with his car. The team moved onto another set of hard tyres for the third stint but then reacted to those around Rosberg and pitted for softs under the Virtual Safety Car for Hamilton’s stranded Silver Arrows, by which point he was already into podium contention and was able to recover to third. Verstappen started well but the Vettel/Rosberg incident delayed him and he lost a little ground. Red Bull opted to split their strategies and unusually it was the second car on the road, Verstappen, who pitted first. He went onto another used set of softs for the second stint, before going onto the hard compound on lap 27. Verstappen was looking in a good position to challenge, despite stopping more times than Ricciardo, but the final trip to the pits on lap 41 – where he went for scrubbed softs again – got rid of his advantage and meant he couldn’t quite challenge for victory. Could Verstappen have won, though? It seems possible Verstappen could have gone to the end on the hard tyres he went onto on lap 27, there were longer stints out there on that compound but it was a risk. Because the VSC levels the pace of the field out, pitstops don’t cost as much time and Ricciardo would’ve easily closed in on fresher rubber. Verstappen, on a different strategy, had looked in a good position but its possible that even if he had stayed out, he would’ve lost the win to Ricciardo. He would’ve had a better chance if Red Bull had put him on new softs, like Ricciardo, for the run to the flag but they may well have been limited with tyre options on Verstappen’s car. Jolyon Palmer finally picked up his first F1 point with 10th place in a very unusual strategy. It’s not often we see all three tyre compounds used at the start but Palmer had the hard tyre for his first stint, so this is exactly what we saw. He moved up the order and dropped back as others pitted, switched tyres and went for different strategies, but decent and consistent pace throughout his long first stint brought Palmer into contention and the hard tyre held up well in the warm conditions. The Brit went onto a new set of softs on lap 31 and from there, he was able to make it to the finish while holding off the advances of Carlos Sainz Jr. and Marcus Ericsson. It was a good drive from Palmer and was also thanks to a strong strategic move by Renault. Considering the warm temperatures, the Pirelli tyres held up very well in the heat and humidity of Malaysia and that meant we could well have saw most of the field pit just twice. 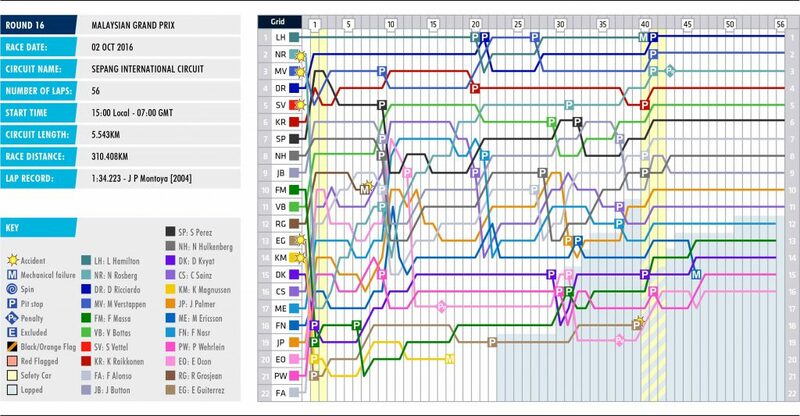 The Virtual Safety Cars shook this up though and effectively gave people the chance to pit without losing as much time. 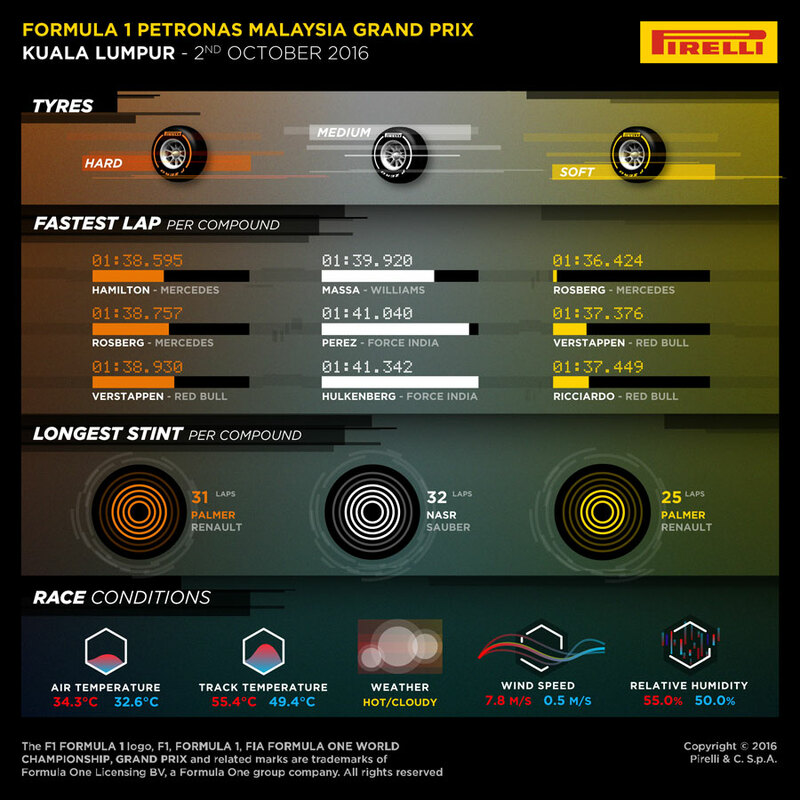 All three tyre compounds got extensive use during the race, with the medium being run by quite a few people in the middle of the stint – Valtteri Bottas, Felipe Nasr and Kevin Magnussen even started on the compound. The hard tyre held up well, with a smaller gap to the medium, so it was actually a popular race tyre. A couple of drivers suffered hits early in the race, with the first corner mayhem sparking several incidents behind them. Felipe Massa, Daniil Kvyat, Esteban Gutierrez and Kevin Magnussen all stopped on lap one and that put them on the back foot from the very beginning. With the VSC then out on lap nine, that made it harder for them to bounce back.